Sterling, VA (October 22, 1998) . . . Gammaflux L.P. is introducing a new line of hot runner system temperature control systems at the K '98 show in Dusseldorf, Germany, October 22-29. In addition, the company will roll out a new and improved version of its state-of-the-art Series 9500 system at the show. This will be the first time Gammaflux has exhibited at the K show, the plastics industry's largest exhibition held every three years in Dusseldorf. In addition to its product introductions, the company will unveil a new logo and corporate identity at K that represents its new status as a truly global plastics industry supplier. modular enclosure packaging for compact size - footprint of 19" w x 8" h x 15" d (483mm x 203mm x 381mm). Each control system supports up to 12 zones, and the GLC 2K is designed to expand as a 24 zone or 36 zone system. It has also been designed to meet the growing trend for quick delivery and in-field flexibility on a global basis. The GLC 2K represents a product that is as close to an "off-the-shelf" hot runner temperature control system as is possible but unlike other off-the-shelf systems it can be customized to meet each molder's unique requirements. Complete information and technical specifications on the new GLC 2K are available in a newly published product brochure. Basic and Advanced Quick-Reference Guides on the use of this product are also available. All literature has been published in multiple languages. Also being introduced at K is the development of a new remote-monitor feature by Gammaflux for its Series 9500 control system. Based on customer requests for communication between injection molding machines and the temperature controllers, with all information readily accessible, Gammaflux has developed a new remote monitor for the Series 9500. This new option allows the monitor to be placed an indefinite distance from the main control cabinet. "This provides customers with a way for the hot runner control screen to be visible at the operator side of the injection molding machine," said Rene Bertschi, Managing Director of Gammaflux Europe GmbH. Complete floppy disk and touch-screen capabilities are now operator-accessible directly on the remote monitor. Only one cable is necessary to connect the monitor to the cabinet. 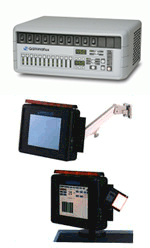 In addition, an Ethernet Interface option has been added to the Series 9500 control system. "These are valuable options that we are now making available to all our customers," said Bertschi. "As happens in many cases, this was a product improvement that we developed based on a customer’s wishes." Gammaflux has been growing steadily internationally over the past three years. Coming off a record year for sales and shipments in 1997, the company is poised for more growth worldwide. A new logo and corporate identity will be unveiled at K '98 to usher in a new era of Gammaflux as a truly global supplier to the plastics industry. The company established its European headquarters office in Wiesbaden, Germany in January 1997. Gammaflux-Europe GmbH has successfully built a solid foundation for the company in Germany and is in the process of expanding the business by adding distributors throughout Europe. Recent representation for the company has been added in Italy and Spain. The company is actively searching for representation in France, the U.K., and Scandinavian countries. Gammaflux also is aggressively pursuing growth in the Asia/Pacific region. Local companies in Hong Kong and Taiwan have recently been signed on to provide sales and service support for Gammaflux in the China market. Companies in Japan and Australia have also been selected to provide sales and technical support for Gammaflux in the region. Based in Sterling, Va. U.S.A., Gammaflux L.P. is a leading supplier of hot runner temperature control systems to the plastics injection molding industry. Long known for innovation in control technology, Gammaflux developed the first products to anticipate temperature changes, sense wiring and heater problems, and react instantly to avoid serious mold damage. Combining digital capabilities with precision analog control, Gammaflux systems enable the user to achieve centralized command of molding systems and retrieve critical data for performance analysis. The company serves the automotive, medical, packaging, electronics, household products, and tool building markets.